The fear of a Canada Revenue Agency (CRA) audit is enough to keep many Canadians up at night. However, there are several steps you can take to reduce the chances of a dreaded audit. Here are some hints and suggestions for you to avoid the hassle of a time consuming and invasive tax audit! The first consideration when avoiding the dreaded CRA audit is to always use tax preparation software to prepare your return. This may seem irrelevant to avoiding an audit, but mathematical errors and other simple mistakes will greatly increase your chances of being selected for an audit. Using tax preparation software will help you avoid such errors, and in the process, avoid that audit letter. Another advantage of using tax preparation software is maintaining consistency between your annual filings. Ensuring that you claim credits in the same fashion year to year can be difficult when using manual calculations and forms. The interview process included in most tax preparation software can help ensure that you are consistent in your application of tax credits. This will reduce your exposure to a potential audit as the CRA looks for sudden inconsistencies in your current tax return compared to the returns of past years. Along with Canadians that operate a small business, you may be eligible to claim home office expenses, either due to your small business or through an arrangement with your employer. Claiming this tax credit will automatically increase your chances of a tax audit. However, there are steps that can be taken to reduce this likelihood. Ensure that you follow all of the detailed guidelines in preparing your calculation of this credit, such as accurately determining square footage amounts and respecting the limits contained within these guidelines. Many Canadians operate small businesses and while these individuals are unfortunately more likely to be audited in general, there are some steps to take in avoiding a CRA audit for these taxpayers. One of the important guidelines for the Canadian Revenue Agency in determining which businesses to select for audit is their profitability. After three consecutive years of operating losses, especially when substantial expense levels are present, there is a high probability of audit. All businesses must have a reasonable expectation of profit, otherwise, the expenses are likely personal and the CRA will be interested in investigating those expenses in detail. Further, business expenses must be reasonable compared to peers in your industry. The CRA will examine, for example, your meals and entertainment expenses as a percentage of your profit, and compare it to other firms operating in similar industries. The Canada Revenue Agency also uses cross-referencing techniques to discover abnormalities in returns, which would trigger an audit. For example, only one parent can claim the dependant amount for a child. Ensure your spouse or even an ex-partner is not duplicating any claims that appear on your return. Doing so will generally trigger an audit for both parties and a reassessment for the individual incorrectly claiming the amount. Disability amounts and relocation expenses are two other common tax credits that trigger audits due to both partners claiming the same expenses. Further, filers must be aware of what deductions are included on their T4 slips from employers and ensure these are not double counted on their return. For example, many employers include union dues deducted from pay on the T4 that is provided to the employee every year. However many unions also send out a tax slip that reports the same dues. Including both of these amounts can trigger a review of your file, leading to both an audit and a reassessment. Employers often include other amounts that can be duplicated, such as certain investment account contributions or charitable donations. And last of all, ensure you file on time. Most late filings to the CRA are subject to additional scrutiny, which greatly increases your chance of a tax audit. 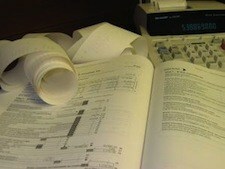 For many taxpayers, this simple step can be the single most important move you make in avoiding a tax audit this year!